Hello all! Well, to say that it's been an exhausting week would be an understatement. I'm just glad I made it to the weekend. I have been promising this post for a long time. 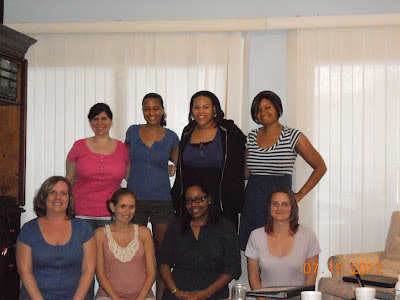 I was lucky enough to attend a writers retreat a couple of weeks ago with some awesome writers from my MFA program and some that I "met" through Blogger. The experience was incredible. I don't have many writer friends in my area, so to be surrounded by writers for almost 72 hours was a treat for me. We stayed at a cozy lake house in North Carolina. We woke up and wrote, ate junk food, watched Dr. Who, wrote some more, ate dinners together, discussed publishing and wrote some more. It was what I like to call a very literary weekend. While everyone was writing, I was editing my novel. It really made me think about a few things. The girls on the retreat challenged me to look at my novel on a much deeper level. I was forced to ask myself some very tough questions. I needed to figure out why I was dragging my feet on editing the damn thing. I've never gone through so many emotions about a piece of my writing. EVER. One minute I hated it, the next I absolutely loved it. I think what I've taken away from it all, is that I do love this novel. When I got home I really took some time to read through the whole thing and reflect. I realized that I only hated the beginning and the end, but I loved the middle. It sort of lit a little spark. My writing buddy Megan has it now and I've been fixing grammar issues while I wait for the comments on the "big picture" issues. I'm so thankful I had the opportunity to meet with such amazing writers and what I took away was invaluable. I can't wait until next year! I love writing retreats. Glad that you got some stuff done.